Considering that the last IMBB I took part in was #16, it would appear that I've been absent from the IMBB scene a very long time indeed. Still, better late than never, I suppose. Many, many thanks to Laura from Cucina Testa Rossa for hosting this IMBB. Chère Laura, je vous remercie de ce thème. I know it seems like the easy option, given the absolutely enormous scope of this IMBB, but I've been itching to try my hand at Boeuf Bourguignon for the longest time, and I can think of no better dish that would go so well with a glass of wine. Hailing from the region of Burgundy, Boeuf Bourguignon (or Beef Burgundy, for all you Anglophiles), is one of those très traditionnel dishes that is to be found at any decent French restaurant, along with such favourites as Blanquette de Veau and Coq au Vin. As with any stew, all you really need is some cheap meat, red wine, beef stock, cheap vegetables and the ability to wait for your dish to cook itself. C'est tout! 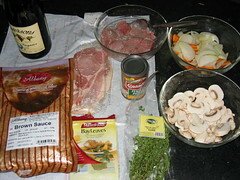 Some notes on the ingredients: Stewing cuts for beef include cuts from the rump and chuck (backside and shoulder). You may cube these yourself or buy them already prepared from the Swiss Butchery. If you decide not to use the bacon, remember to use a few more tablespoons of olive oil. Start off by frying your bacon with the olive oil in a pot deep enough to hold all the ingredients (the last thing you want is to have your wine and stock overflow). While that's taking care of itself, coat your beef cubes lightly with the flour, which helps dry them out and aids in browning them. 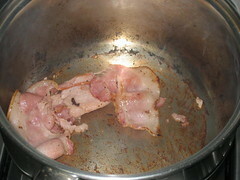 Once your bacon has rendered a goodish amount of fat, remove it and start to sear your beef cubes. Try not to set off any smoke detectors. Make sure there's enough oil in the pot, or your meat won't form a nice crust and all your flour will just stick to the base of the pot, as you can see here. 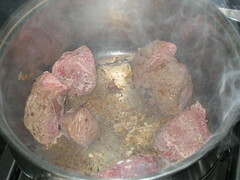 Remove your meat and toss in the garlic and vegetables to brown. 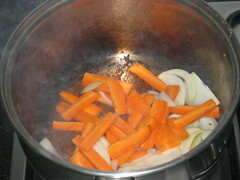 Carrots, onions and celery are good friends, so don't be afraid to keep them in there a little longer. Not too long though, because the mushrooms want a piece of the action too. Throw them in to cook till they've turned golden and start glistening. Since the meat requires a much longer time to cook than the vegetables, remove the vegetables to a separate container while you return the meat to the pot, along with the wine, stock, tomato paste and herbs. The liquid should just about cover the meat. Feel free to add in a cup of water to reduce the saltiness of your stewing liquid. 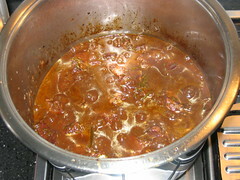 Let it simmer away on your stovetop for an hour, topping up the liquid every fifteen minutes or so with water (you could use wine or stock, but that does make the sauce a bit salty). 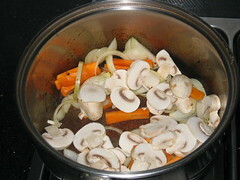 After an hour, add your vegetables to the mix and continue to let the stew simmer for another hour or so. Now you may notice that I'm being quite imprecise about the time. This is because I can assure you that this particular stew requires at least 2 hours to cook, if not more, depending on how much meat you're cooking. So please budget on about 2 - 3 hours cooking time. The best test is the fork test; if a fork pierces the beef easily, it's cooked. Having said that though, it's almost impossible to overcook stews, so if your beef is tough and stringy, it means you've undercooked rather than overcooked it. 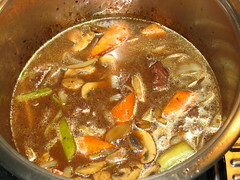 Once the meat is tender, Julia recommends removing all the vegetables and meat in order to boil down the sauce to thicken it. You could do this, though it's a bit of work. 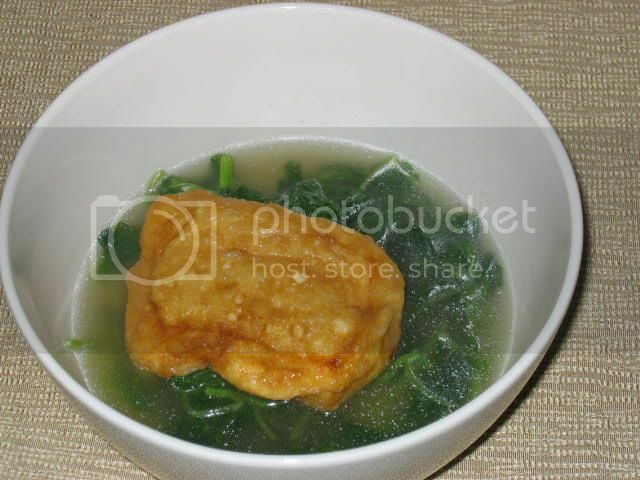 You could also thicken it by using beurre manié or kneaded butter, which is basically just 1 tablespoon of butter and 1 tablespoon of flour mixed to form a dough and whisked into your sauce over low heat till the desired thickness. Or, you could just be lazy and leave your stew as it is. C'est okay, really. As you can see, I was a bit greedy in dishing out the stew. I served it with some last-minute mashed potatoes, but it'll go well with couscous, risotto, noodles, just about any sort of carbohydrate. 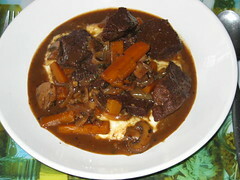 Boeuf Bourguignon, like all stews, refrigerates and freezes extremely easily, and tastes even better the next day once all the flavours have had time to develop and bloom. As Julia says, "carefully done, and perfectly flavoured, it is certainly one of the most delicious beef dishes concocted by man". Now, she may be indulging in a little culinary hyperbole, but she's not that far from the truth. Et voilà, ma contribution à l'IMBB de ce mois-ci et bon appétit à tous! Footnote: I know I was supposed to include a glass of wine, but considering this recipe used a good half-bottle of wine, I'm sure I'll be forgiven for that small omission. 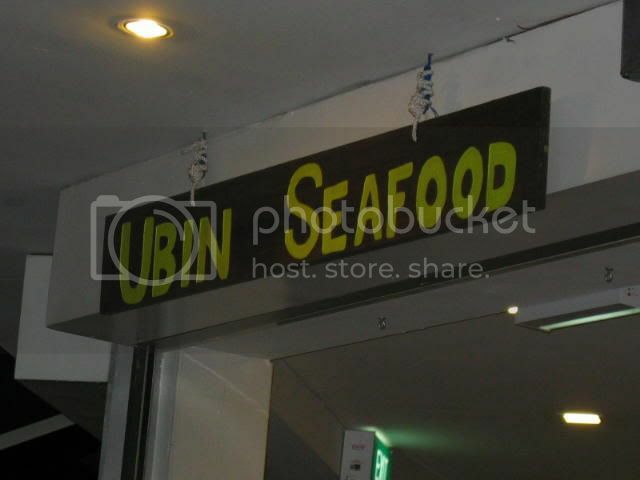 Just down the same row of shophouses and restaurants as Corduroy and Finch, is a new restaurant called Ubin Seafood. Since it is so close to home, we tend to drive by pretty often, and it seems that every time we passed it, the place was filled with more and more diners. Eventually, I discovered that this particular outlet of Ubin Seafood (there's another one in Ponggol) is owned by the family of my friend and colleague Alex, a fellow gourmand whom some of you may remember as the generous host of a birthday dinner at Sebastien's. Well, with a pedigree like that, there was absolutely no reason not to go visit. So on Friday, the boys and I went down for some good ol' Ubin Seafood. Ubin subscribes to a generally al fresco concept because, really, what other way is there to enjoy chilli crab? It would have been more authentic to enjoy your seafood by the sea, but I suppose the Bukit Timah canal will have to suffice. Thankfully there were numerous fans strategically located to circulate the air and prevent the area from getting unbearably warm, but I would still recommend dressing very casually and choosing a cool night to visit. We pretty much left it up to Keith to do the ordering, and I'm very glad we did, because all his orders were spot on, with almost nothing left over. 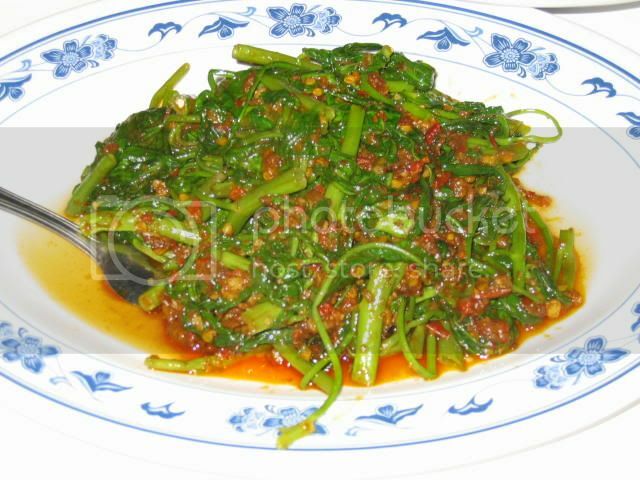 An order of sambal kang kong (Chinese kale) ($8), because we're all very health-conscious. I'm not actually very fond of sambal kang kong, because I tend to find it a bit too spicy for me, but this was pretty good. Spicy and crunchy, it's probably one of those obligatory orders. Still couldn't eat much though. 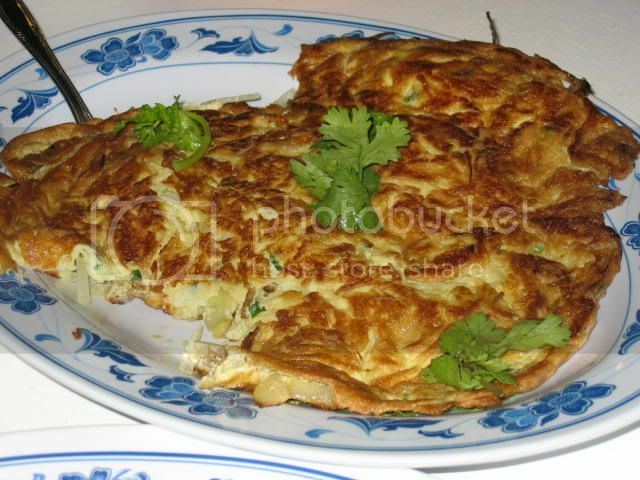 We also had a plate of onion omelette ($8), which is one of three omelettes they serve, the other two being prawn and oyster. I'm glad we ordered this, onions and eggs seem to me a much better combination than prawns. No complaints here at all, the omelette was easily polished off by us. Next, an order of har jiong kai or deep-fried prawn paste chicken ($12), which for all its mouthful, was absolutely delicious. Sweet, tender and juicy, these were quickly demolished too. 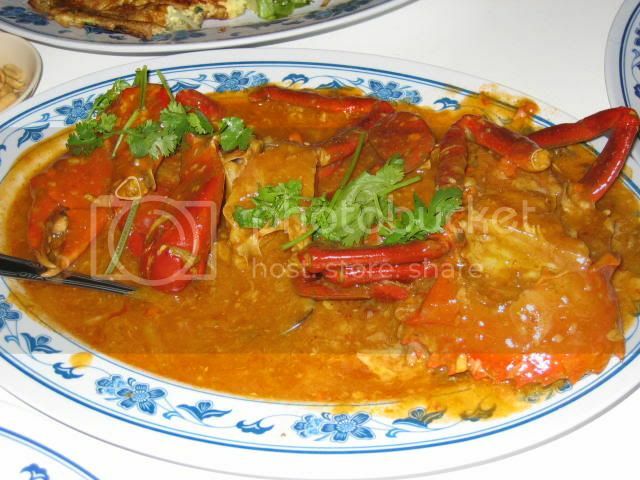 There is no way you can go to a seafood place and not order chilli crab. It's simply something you don't do here in Singapore. So naturally we had to have us some chilli crab ($3 per 100g, total $24). The sauce is the best part, and the one at Ubin Seafood is just spicy enough, thick and lush, good enough to lick off your fingers. I'm not a crab connoisseur, but I thought it was pretty good. 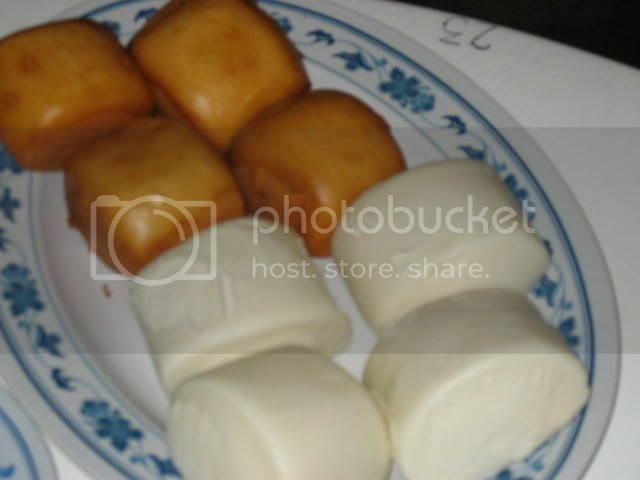 Chilli crab also cannot be eaten without these man tou or buns ($1 each). I enjoyed the fried ones, and was much too full to try the plain ones. 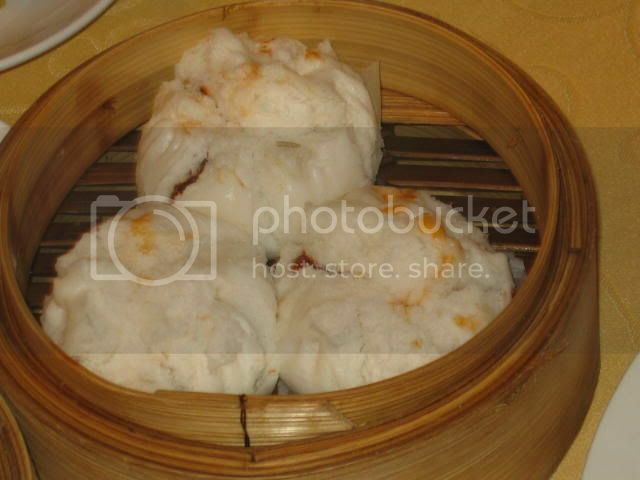 Each bun is as filling as a bowl of rice, so be sure not to over-order. 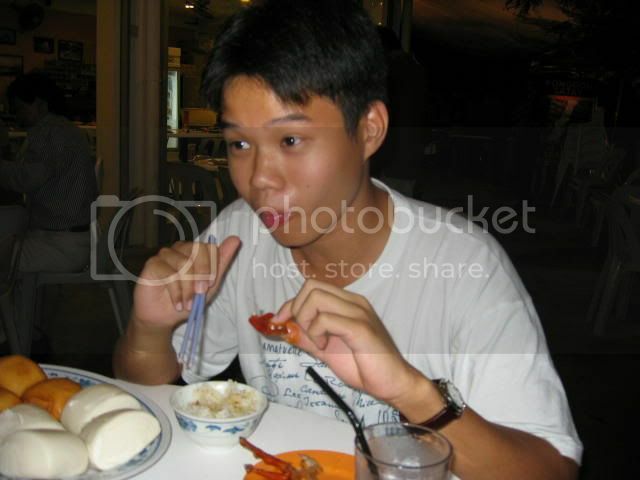 And here you see Xiaozheng, the chilli crab virgin, learning how to eat his first chilli crab. He looks bemused. I know this seems like a big plug, and it probably is, but I really did enjoy dinner at Ubin Seafood, and wouldn't hesitate to recommend it as an inexpensive place to have lunch (Set lunches start from $4.80) or dinner ($20 per person for the four of us). Of course, its location has plenty to do with it, being about five minutes away from my place. In terms of ambience, it's not Les Amis, but as long as it hasn't been too hot, and you're not attired too warmly, Ubin Seafood is pretty decent as an outdoor place. In terms of service, the restaurant is fair crawling with waitstaff, which means you never have to wait for service, and food arrives pretty quickly. Overall: Good affordable seafood without having to travel to the coast, but be sure to try other items on the menu. 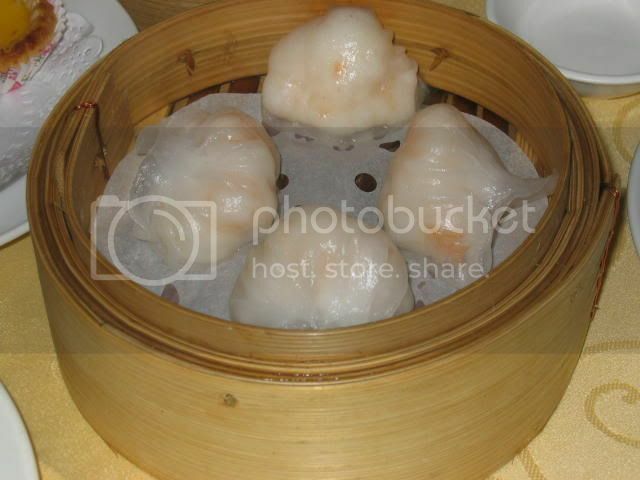 Sometimes, you're in the mood for dim sum, but you have no real desire to fight the crowds at the popular dim sum places like Crystal Jade or Lei Garden. All you're really looking for is a quick meal. Where do you go? 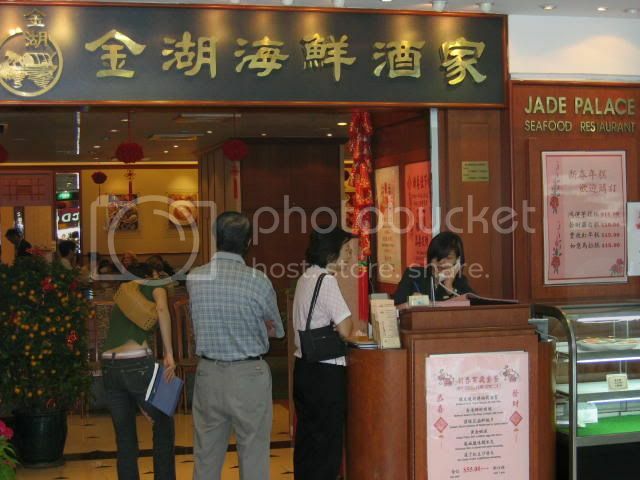 Well, one option is Jade Palace in Forum Galleria, a more modest establishment that has soldiered on in the face of competition from its more prolific rivals. 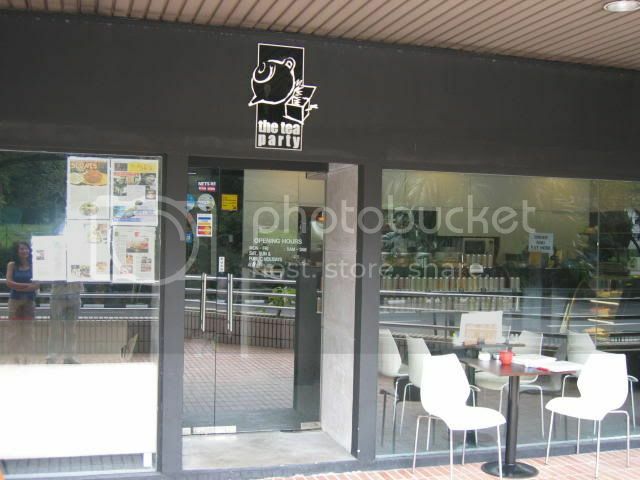 Located at the basement of Forum Galleria, the restaurant is a nice place to stop for lunch afer shopping at Toys 'R' Us, or if, like us, you hadn't made a prior reservation somewhere else. While not full to the brim with cacophonous patrons, the restaurant still attracts its fair share of diners, so you certainly won't be eating alone. 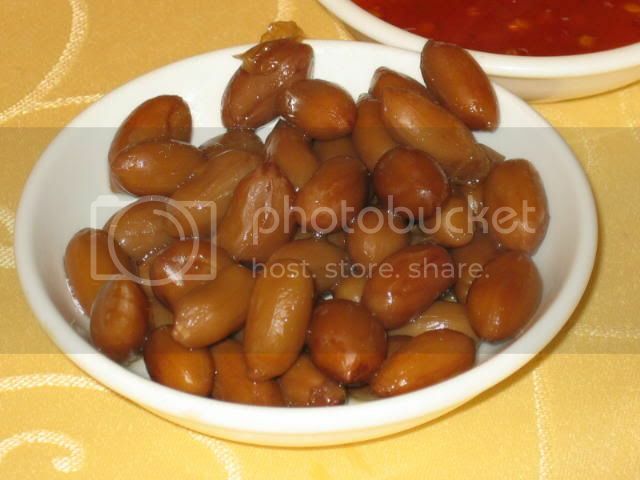 Personally I think the best thing about this place is the steamed peanuts they serve you at the start of the meal. Steamed peanuts used to be so common at any Chinese restaurant, but now they're an extreme rarity. For some reason I can't get enough of the little things, and I could easily polish off three or four plates before the meal begins. 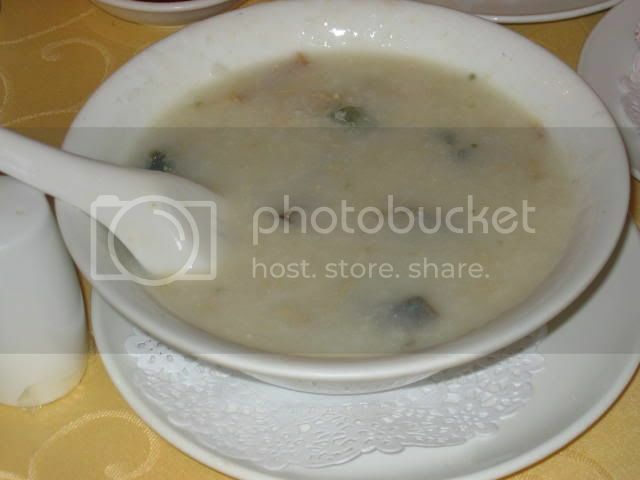 My sister always craves century egg porridge when we have dim sum. None of it for me though. 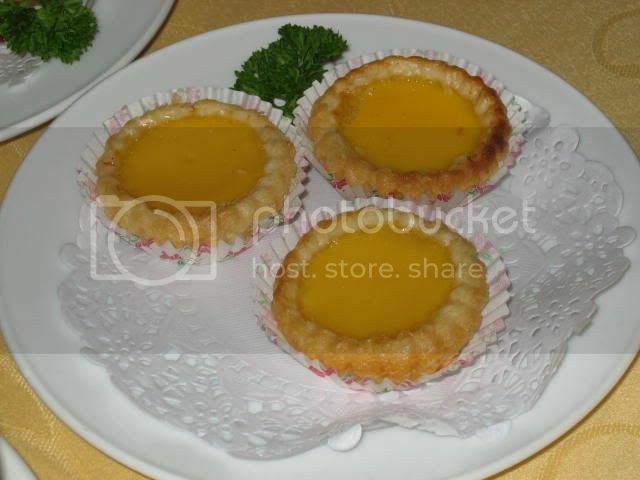 We had an order of steamed egg tarts ($3.80). You can see that one of them was slightly singed, which is not really a good sign. 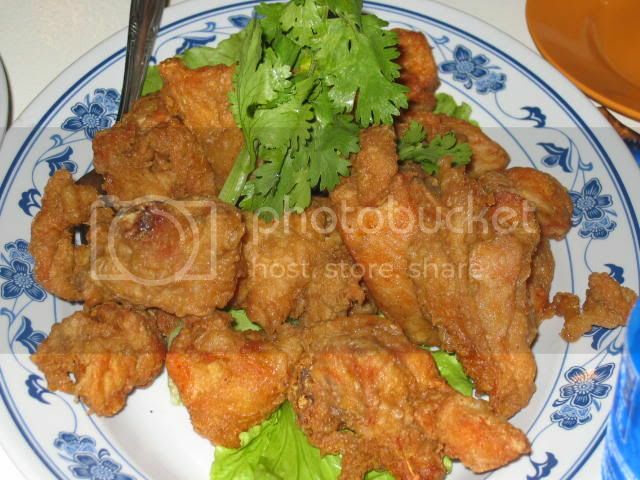 Thankfully, in terms of taste, it didn't suffer much, but the disparity between the quality of food between Jade Palace and some of the higher-end restaurants is noticeable. The char siew sou ($4.20) was perhaps the most disappointing item of the entire meal. 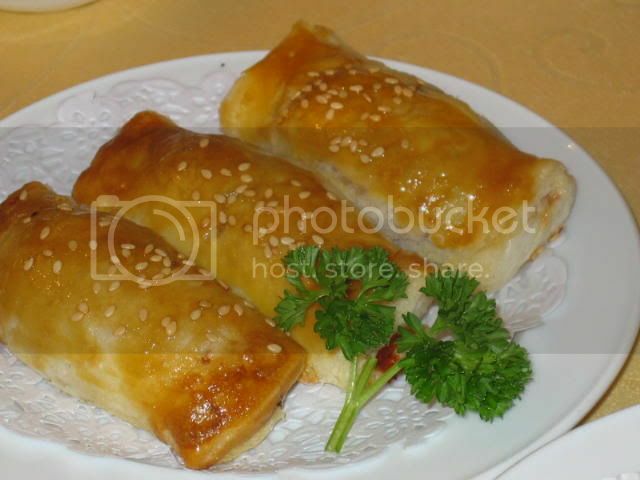 They're meant to be served piping hot, steaming as you bite into the crispy pastry and exposing the sweet meat within. Yet, the pastry was merely at room temperature. 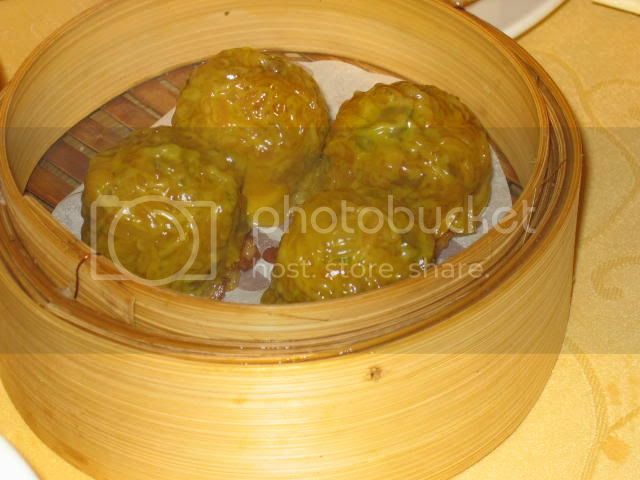 The siew mai ($5) was pretty decent, but again, not the most delicate dim sum you can find. 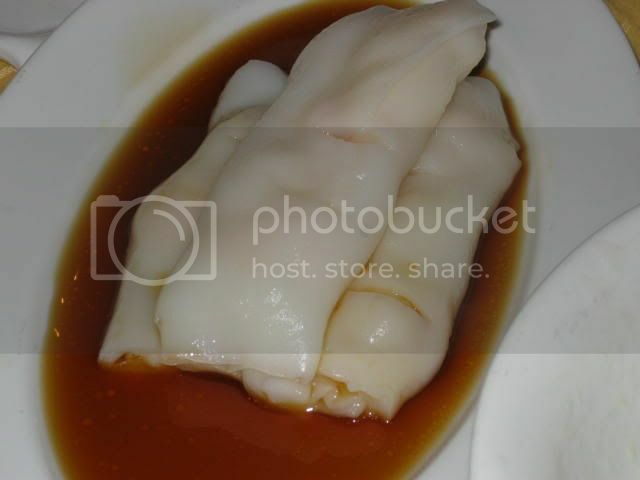 The steamed shrimp dumpling ($5) was also good, except the skin wrapping it was a bit thick. Only a problem if you're expecting the best, which you shouldn't be. I quite liked the pan-fried carrot cake ($4.20), which was starchy and tasty, though it could get very filling if you ate it in sufficient quantities. 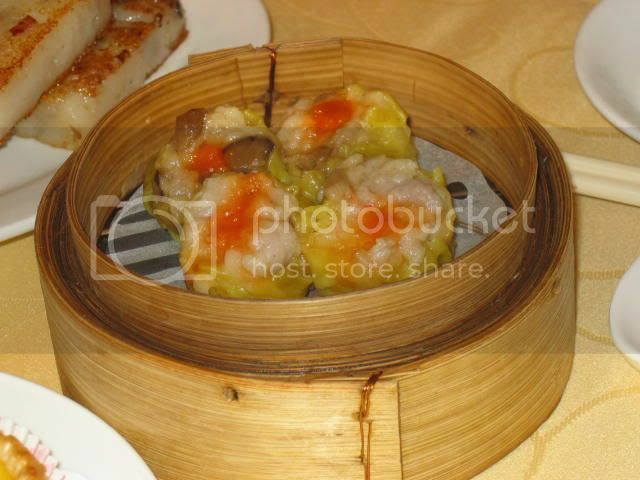 The steamed shrimp roll ($6.80) was very enjoyable, and is generally a safe order in any Chinese restaurant. This was the other item I didn't enjoy. 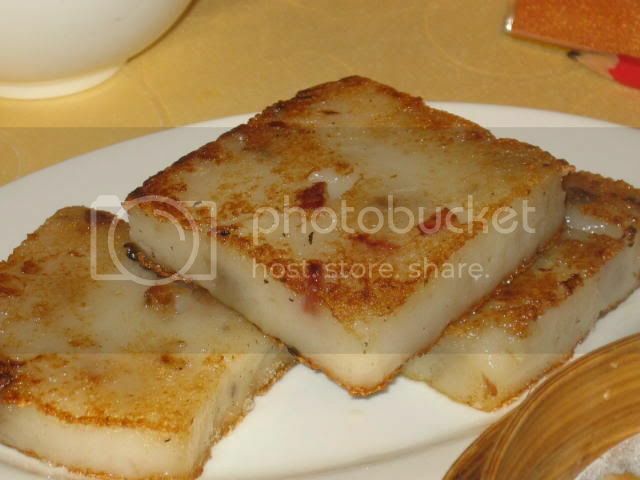 The steamed glutinous dumpling ($5) was basically just glutinous rice stuffed into some sort of skin and steamed. Rather tasteless. Lunch rounded off with an order of char siew pau ($4.20). You can see from the ochre hues on the buns that some of the sauce from the meat must have seeped through. Again, an indication of a less than highly-skilled chef, though the taste wasn't much affected. Service is generally acceptable, there aren't throngs of waitstaff, so you have to try a bit harder to attract their attention. One of the good things about being a flogger is that you get the lowdown on all the interesting new restaurants opening in town. 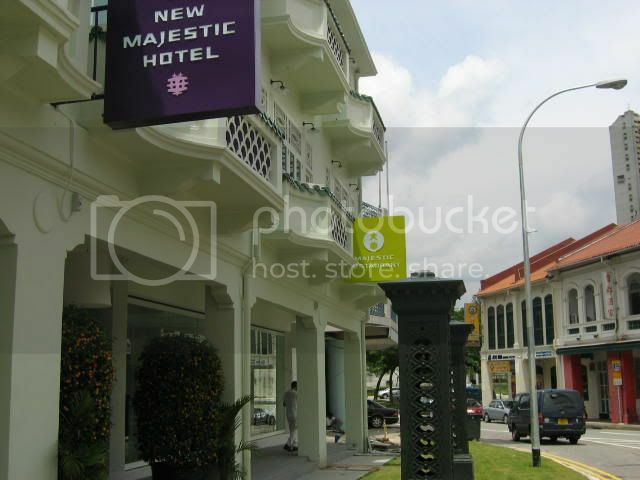 Take, for instance, Majestic Restaurant, which Chubby Hubby blogged about recently. He's covered the background of the Majestic Hotel, its restaurant and the history of the chef-owner in great detail, so do give it a read, it's most informative. The other good thing about being a flogger is that you get to benefit from reading other floggers' opinions and experiences. My sister (who was buying us lunch) said that she had shamelessly ordered many items on the strength of Chubby Hubby's recommendations in his review. 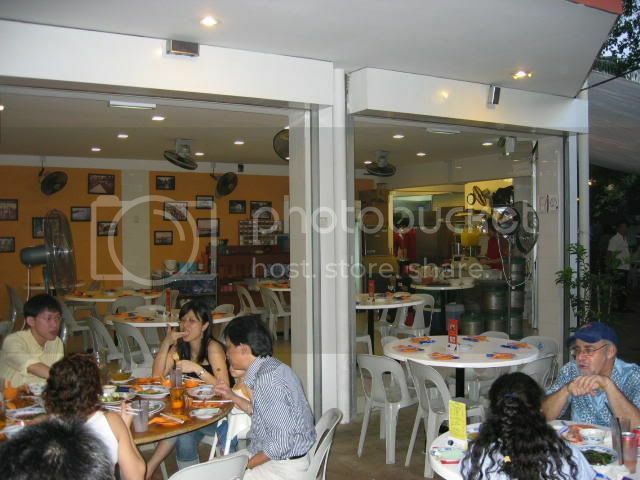 The restaurant is located in the New Majestic Hotel, along Bukit Pasoh Road, which, for those too young to remember, is off Neil Road and Keong Saik Road, close to other yummy eateries like Da Paolo and Restaurant Ember. 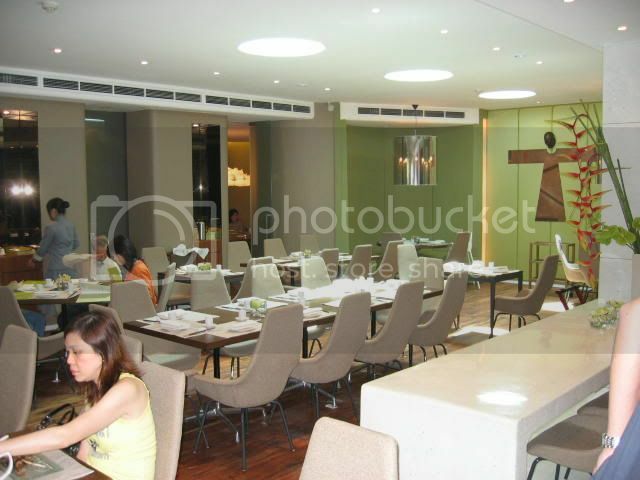 The interior of the restaurant is pretty chic, very sleek and modern-looking. We, however, were not sitting in the common area. We were fortunate enough to get a private room, which unfortunately could have been designed a little bit better. I had my doubts about the lamps, which to my mind resembled underwater mines, and the couch by the wall was too high and offered insufficient leg support. Majestic offers modern Cantonese food, which is kind of like Chinese with French influence rather than the other way around. Still, it's enough of a reimagining that you can't order food the traditional Chinese way; you have to order individual portions, almost as if you were in a Western restaurant. 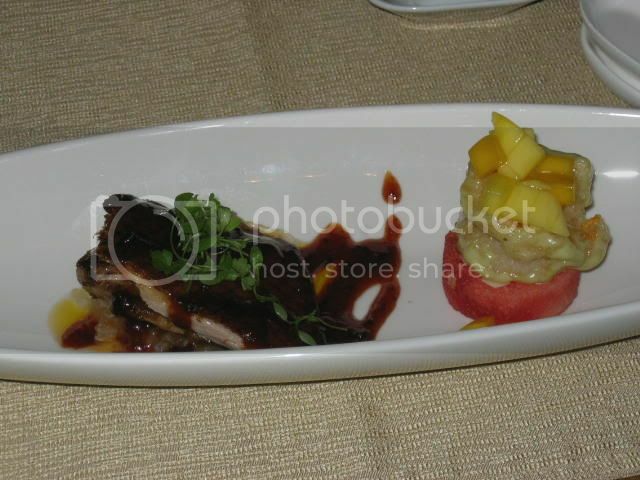 We started with an order of Peking Duck served with pan-seared foie gras, paired with a crispy prawn in wasabi dressing that was served with some diced mango and a watermelon medallion ($15). I thought the Peking Duck and foie gras combination was a little overly rich, fairly glistening with oil. The duck wasn't crispy enough, and the foie gras hadn't been sauteed at a high enough heat, as it was a bit too soft and runny. The crispy prawn though, was really delicious. The fried batter crunched in your mouth while the prawn was juicy and piquant with the wasabi sauce, whose pungency was just nicely offset by the fresh fruits. 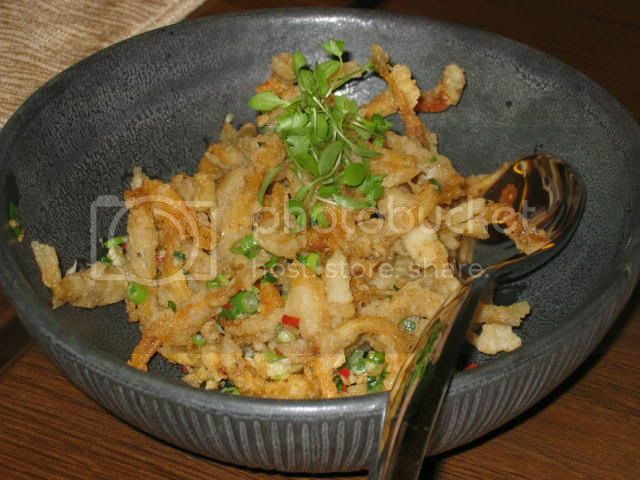 We also had an order of fried whitebait, which I didn't like so much. Seemed a bit overfried to me; the little fish were so crunchy they felt ossified. 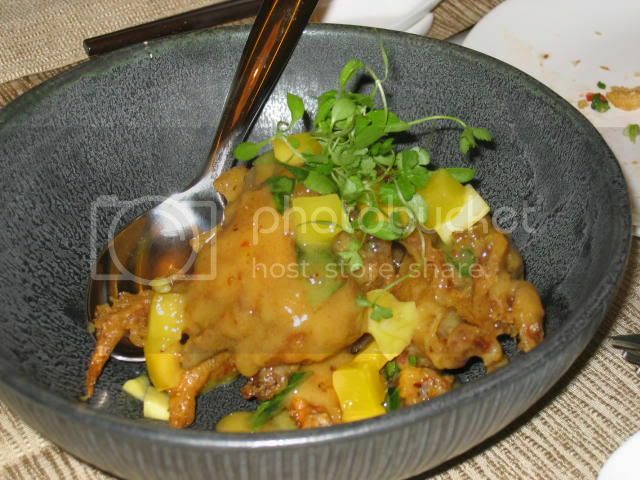 Next we had a soft-shell crab served with a lime sauce. This would have been a very nice dish, but they were a little heavy-handed with the sauce, which was overpoweringly citric. I really enjoyed the soup. I thought the mini pumpkins were incredibly adorable, and if anyone knows where to get them, let me know! 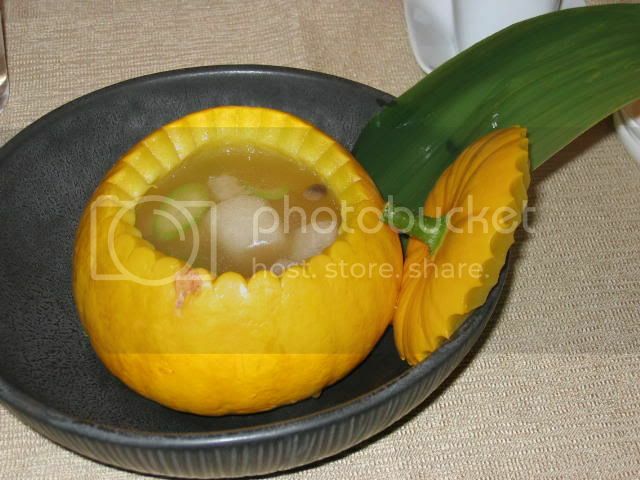 The pumpkins were steamed, which means you could savour the flesh of the pumpkins as you were drinking your soup. The soup itself, I'm pleased to say, was piping hot and remained that way for a long time, and was a rich consomme of prawns, scallops and mushrooms. We also tried the lamb chop served with carrot cake ($18), which is perhaps the most memorable and winning fusion concept I've ever had. The lamb was amazingly tender, and the carrot cake was thick, gooey and clearly reflected a lot of effort and thought. 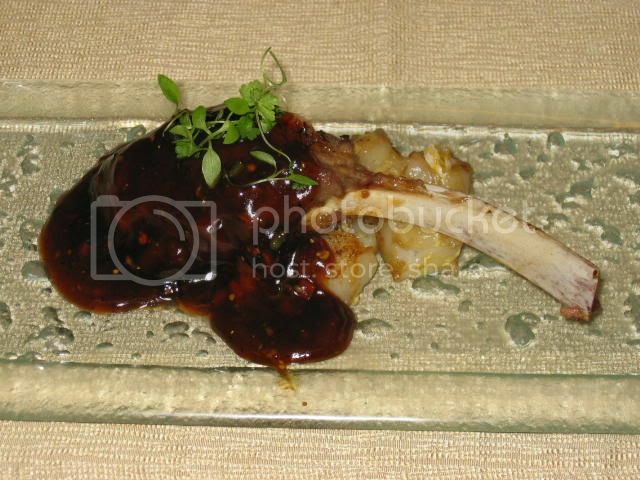 Again though, they could have been a bit more sparing with the rich, black-pepper sauce. Compared to everything else we had, the tofu and braised spinach was very simple, but it was a good way to wind down our meal. The Majestic certainly has a fairly majestic way of presenting the humble mango pudding. 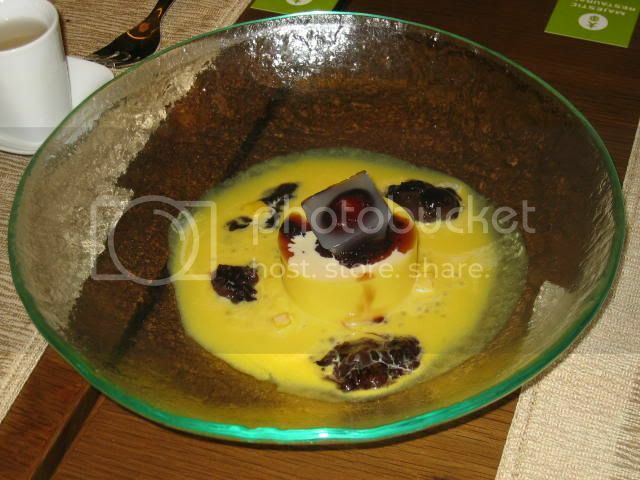 An unmoulded, jelly-like pudding floating in a pool of mango juice. It also comes with some helpings of pulut hitam, which isn't really my thing. 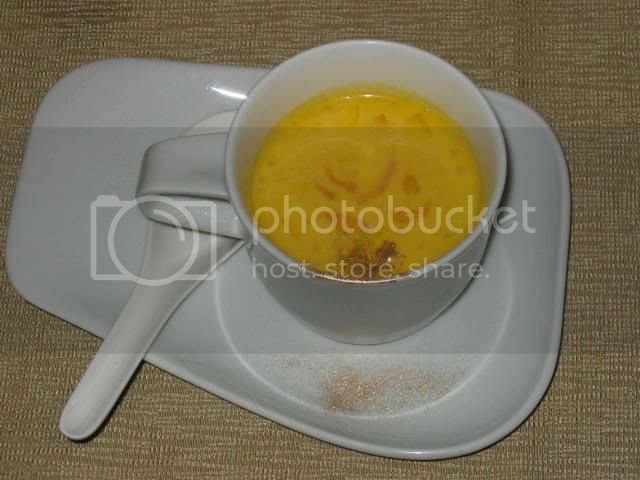 The mango sago was a lot more conventional, apart from the liberal sprinkling of gold dust. You generally won't go wrong with mango sago, but the problem with being safe is that it's hard to get anything mind-blowing too. I still maintain, despite Jireh's protestations to the contrary, that this part of town is a nightmare to find. I don't even know how to drive there, let alone changing lines on the MRT. Service was pretty excellent though, with waitresses asking if we enjoyed our meal or had anything to suggest to the chef. In fact, the chef, Mr. Yong himself, came out to talk to us and thanked us for coming. Now that's service. Still on my visionary quest to find the best scones in Singapore, I decided to try out the Tea Party with May. The Tea Party, unsurprisingly, is a little nook in off Sixth Avenue dedicated to the enjoyment of tea. They bill themselves as "a tea lover's haven offering 101 premium teas to ease away all your tensions that arise due to the demands of our fast paced society". Can't get much better than that. Here you see May studying the menu assiduously, looking suitably gentille while trying to figure out the different blends of tea. There are a number of couches for lounging, though they're not totally comfortable for people like me with long legs. The Tea Party does allow you to use their power points for your laptops and shavers, but they charge you an hourly fee. What's a tea party without food, right? The Tea Party serves scones, cakes, and assorted goodies. Since I am not a great connoisseur of tea, we just decided to share a pot of Sunday blend($8). Tea is tea to me, so I can't really say much about the Sunday blend save that it was hot and quite nice to drink. 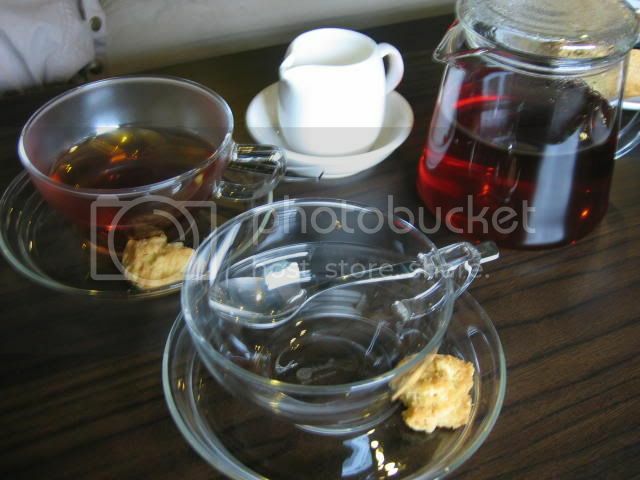 It seems like every tea parlour in town is using these funky see through teapots and cups these days, as I remember seeing them in Cafe Rosso. 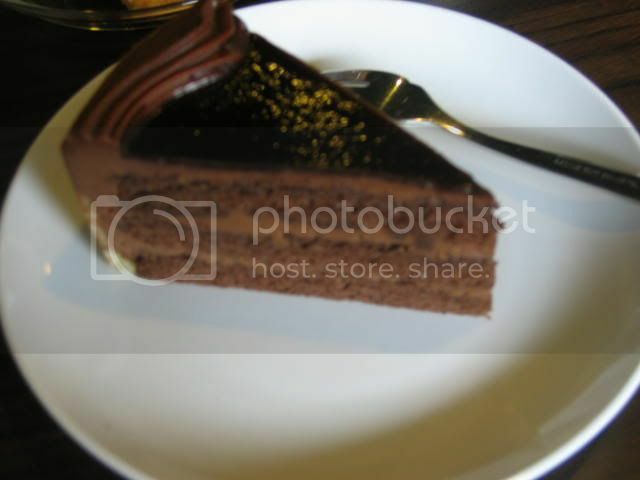 I decided to have a slice of chocolate fudge cake ($5) to go with my tea. The cake wasn't too bad, though not as dense and moist as I would have liked it to be. The chocolate used was probably 40-50% at most, but then again you don't really expect Valrhona for $5. 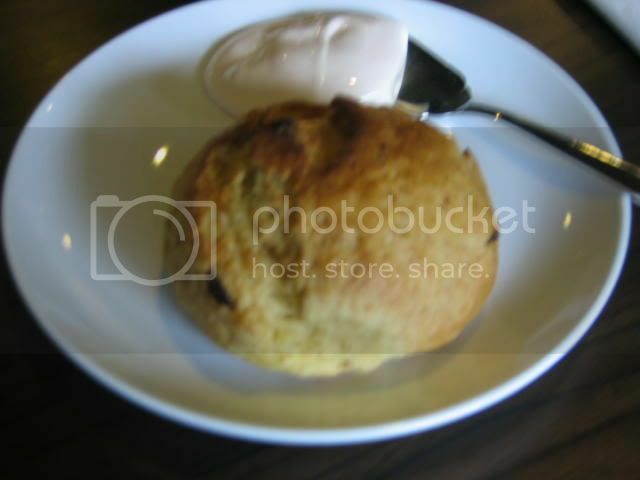 Well one of us had to have a scone, so May chose a raisin scone with strawberry clotted cream ($2.50). I must admit I was a little apprehensive about the scones, since they're not freshly baked (does no one serve scones fresh from the oven these days? ), but it wasn't too bad at all. Although not soft and crumbly like a fresh scone would have been, at least it wasn't rock hard. I also thought they should have served butter with the scone, rather than just the clotted cream. 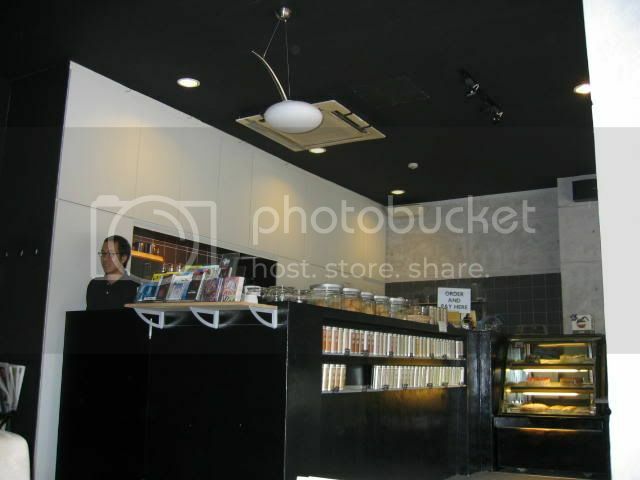 Service at the cafe is pretty decent, where the staff are willing to help you out and give you recommendations. Plus, you get a coupon that entitles you to 20% off your next order. They're also available for business meetings and customised tea parties.